Those feathers are not implemented yet. This change to the breeding system is fantastic, I'm excited about this update. How do you heal the chocobo? There are currently no options in chococraft to heal a chocobo. Vanilla Splash potions of healing should work fine though. Are the 1.12.1 versions of this mod compatible w/ 1.12? Chocopedia book into game ? I might add something similar to the chocopedia later on, its not a high priority right now. But I will make sure that everything is documented when I release an update with the breeding and ability system in place. ohhhhhhhhhhhhhhhhhhhhhhhh myyyyyy i love this mod!!! I got an strange behaviour when using the first 1.12.1 alpha build with forge 2452: the creative tab of the mod got mixed with the one for sensorcraft. 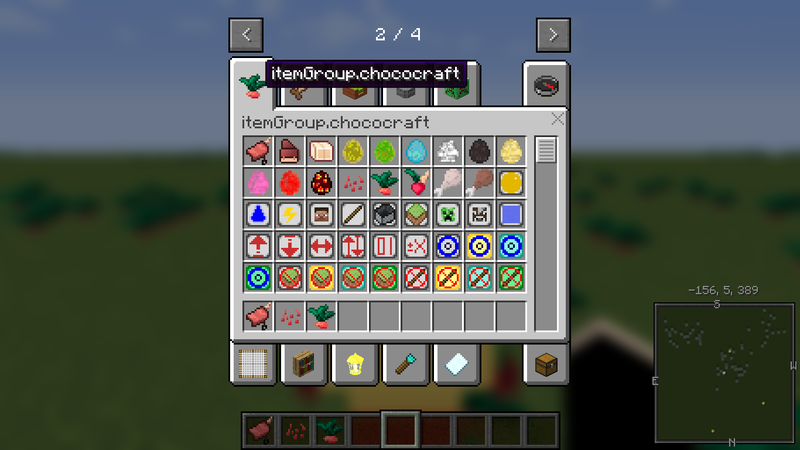 I dont think this is a bug in chococraft but rather in sensor craft. In 1.12 modders need to check if the creative tab, that is passed to getSubItems() is the correct one. Looks like SensorCraft is not checking for that. If my assumptions are correct, you should see sensorcraft items in all creative tabs, not just chococraft. Yep. Cube says he fixed the bug. Sorry for annoying you. Im sorry to say, i forgot to implement the sounds :x (Mostly due to licensing issues, looking for alternative sounds with a more permissive license). But they will get sounds soon.